His progress in his professional studies, however, was | rterer interrupted, and his practice became considerable. In 1588, he discharged the office of reader at Gray’s Inn, and such was his fame, that the queen honoured him by appointing him her counsel learned in the law extraordinary, but whatever reputation he derived from this appointment, and to a young man of only twenty-eight years of age, it must have been of great importance, it is said he derived from her majesty very little accession of fortune. As a candidate for court-preferment, and a lawyer already distinguished by acknowledged talents, it might be expected that the road to advancement would have been easy, especially if we consider his family interest, as the son of a lordkeeper, and nephew to William lord Burleigh, and first cousin to sir Robert Cecil, principal secretary of state. 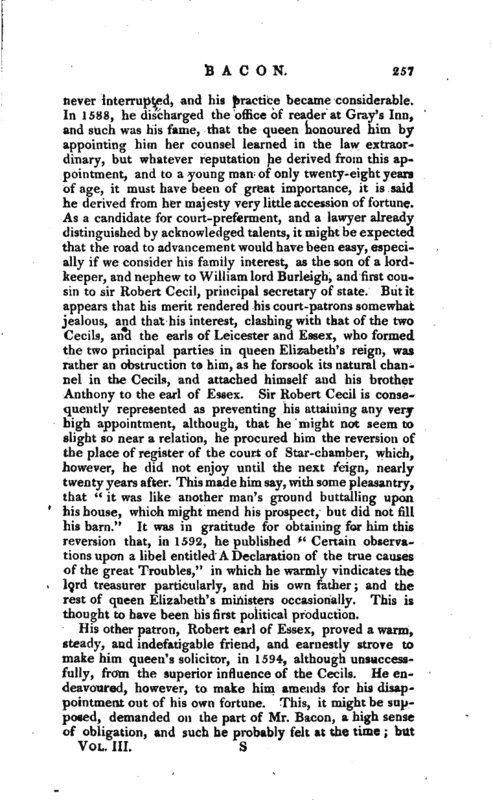 But it appears that his merit rendered his court-patrons somewhat jealous, and that his interest, clashing with that of the two ’Cecils, and the earls of Leicester and Essex, who formed the two principal parties in queen Elizabeth’s reign, was rather an obstruction to him, as he forsook its natural channel in the Cecils, and attached himself and his brother Anthony to the earl of Essex. Sir Robert Cecil is consequently represented as preventing his attaining any very high appointment, although, that he might not seem to slight so near a relation, he procured him the reversion of the place of register of the court of Star-chamber, which, however, he did not enjoy until the next reign, nearly twenty years after. This made him say, with some pleasantry, that “it was like another man’s ground buttalling upon his house, which might mend his prospect, but did not fill his barn.” It was in gratitude for obtaining for him thb reversion that, in 1592, he published “Certain observations upon a libel entitled A Declaration of the true causes of the great Troubles,” in which he warmly vindicates the lord treasurer particularly, and his own father; and the rest of queen Elizabeth’s ministers occasionally. This is thought to have been his first political production. His other patron, Robert earl of Essex, proved a warm, steady, and indefatigable friend, and earnestly strove to make him queen’s solicitor, in 1594, although unsuccessfully, from the superior influence of the Cecils. He endeavoured, however, to make him amends for his disappointment out of his own fortune. This, it might be supposed, demanded on the part of Mr. Bacon, a high sense of obligation, and. 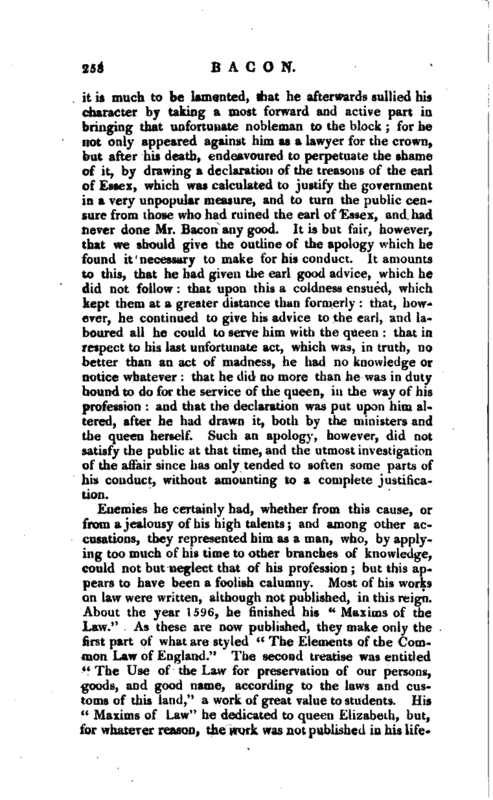 such he probably felt at the time but | it is much to be lamented, that he afterwards sullied his character by taking a most forward and active part in bringing that unfortunate nobleman to the block for he not only appeared against him as a lawyer for the crown, but after his death, endeavoured to perpetuate the shame of it, by drawing a declaration of the treasons of the earl of Essex, which was calculated to justify the government in a very unpopular measure, and to turn the public censure from those who had ruined the earl of Essex, and had never done Mr. Bacon any good. It is but fair, however, that we should give the outline of the apology which he found it necessary to make for his conduct. It amounts to this, that he had given the earl good advice, which he did not follow that upon this a coldness ensued, which kept them at a greater distance than formerly that, however, he continued to give his advice to the earl, and laboured all he could to serve him with the queen that in respect to his last unfortunate act, which was, in truth, no better than an act of madness, he had no knowledge or notice whatever that he did no more than he was in duty bound to do for the service of the queen, in the way of his profession and that the declaration was put upon him altered, after he had drawn it, both by Uie ministers and the queen herself. Such an apology, however, did not satisfy the public at that time, and the utmost investigation of the affair since has only tended to soften some parts of his conduct, without amounting to a complete justification. Enemies he certainly had, whether from this cause, or from a jealousy of his high talents; and among other accusations, they represented him as a man, who, by applying too much of his time to other branches of knowledge, could not but neglect that of his profession but this appears to have been a foolish calumny. Most of his works on law were written, although not published, in this reign. About the year 1596, he finished his “Maxims of the Law.” As these are now published, they make only the first part of what are styled “The Elements of the Common Law of England.” The second treatise was entitled “The Use of the Law for preservation of our persons, goods, and good name, according to the laws and customs of this land,” a work of great value to students. His *' Maxims of Law“he dedicated to queen Elizabeth, but, for whatever reason, the work was not published in his life^ | time. The next year he published a work of another kind, entitled” Essays, or Counsels Civil and Moral.“This work is well known, and has been often reprinted. The author appears to have had a high opinion of its utility and of the excellent morality and wisdom it inculcates there probably never has been but one opinion. Some of these essays had been handed about in manuscript, which he assigns as the reason why he collected and published them in a correct form. About the close of the succeeding year, 1598, he composed his” History of the Aliena tion Office," which was not published till many years after his decease, indeed not until the publication of his works in 1740, when it was copied from a ms. in the Inner Temple library. It is needless to mention some smaller instances of his abilities in the law, which, nevertheless, were received by the learned society of which he was a member, with all possible marks of veneration and esteem, and which they have preserved with the reverence due to so eminent an ornament of their house. As a farther proof of their respect, they chose him double reader in the year 1600, which office he discharged with his usual ability. He distinguished himself likewise, during the latter part of the queen’s reign, in the house of commons, where he spoke often, and with so much impartiality as to give occasional umbrage to the ministers. To the queen, however, he preserved a steady loyalty, and after her decease, composed a memorial of the happiness of her reign, which did equal honour to her administration, and to the capacity of its author. He transmitted a copy of this to Thuanus, who made use of it in his history, but Mr. Bacon contented himself with enjoining that it should be printed after his’ decease. It is a work of much elegance and ability. In the mean time he gave evidence of the steady prosecution of his studies by publishing, in 1605, the first specimen of his great work, in his book “Of the Advancement of Learning,” a performance of much value even in its detached state. He continued, however, his diligence in parliament, and among other topics, endeavoured to second the views the king had entertained of an union between England and Scotland but his efforts for the crown were more successful in Westminster-hall than in that assembly. About this time he married Alice, daughter of Benedict Barnham, esq. alderman of London, a lady who brought him an ample fortune, but by whom he never had any children. In 1607, he succeeded in his application for the solicitorship, on a vacancy, and with that his practice encreased most extensively, there being few causes of importance in which he was not concerned. He assured the king, before he obtained this employment, that it would give him such an increase of capacity, though not of zeal, to serve his majesty, that what he had done in times past should seem as nothing, in comparison with the services he should render for the future and in this respect he is said to have kept his word, for in the session of parliament hold in the year in which he was made solicitor, he ran through a great variety of business, and that of a nature which required a man not only of great abilities but of great policy, and of equal reputation. 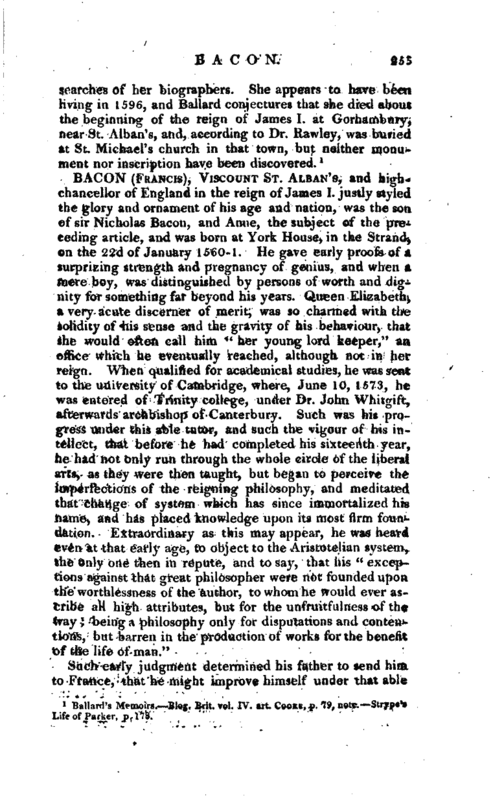 He was, in the first place, employed by the house of commons to represent to the king the grievances under which the nation laboured and though the paper relating to them was couched in terms not very agreeable to the king’s temper, sir Francis, by his accompanying address, so abated their | harshness as to perform this difficult commission with universal applause. 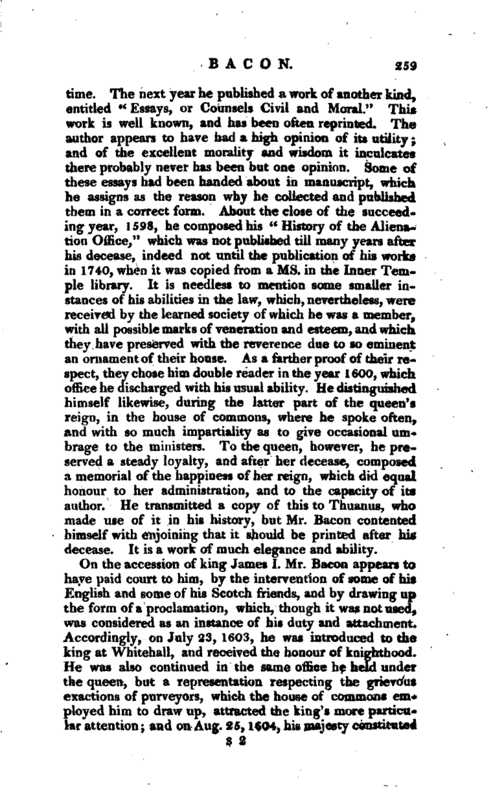 He was likewise employed by the house at a conference with the lords, to persuade them to join in an application to the crown, for the taking away the ancient tenures, and allowing a certain and competent revenue in lieu of them and in his speech on this occasion, sir Francis Bacon set the affair in so clear a light, as excited that spirit, which at length procured the dissolution of the court of Wards, a point of the highest consequence to the Jiberties of this kingdom. He likewise satisfied the house at a time when they were much out of temper at the manner in which the king’s messages were conveyed to them and procured their acquiescence in the supplies by a well-timed speech, which must have convinced the king of what importance his services were likely to prove. Amidst all these political and professional engagements, he found leisure to digest the plan of the second part of his great work, which he transmitted to some judicious friends for their opinion. This piece was entitled “Cogitata et Visa,” and contained the ground-work or plan of his “Novum Organum,” so essential a part of his “Instauration,” that it sometimes bears that title. Bishop Andrews and sir Thomas Bodley w r ere two of the persons whose advice he solicited on this occasion, and their answers are printed in his works, where we have likewise a small discourse in English, under the Latin title of “Filum Labyrinthi,” which was the original draught of the “Cogitata et Visa.” While availing himself of the opinions of his learned contemporaries, he published in 1610, his celebrated treatise “Of the Wisdom of the Ancients,” a work which received and has ever retained the justest applause. It is not easy to say which is most conspicuous in this, his diligence in procuring the materials, or his judgment in disposing of them. At this time his favour with the king, and his general popularity were very high, yet we do not find that he availed himself much of either, in the advancement of his personal fortune, excepting that in 1611 he procured the office of judge of the marshal’s court, jointly with sir Thomas Vavasor, then knight- marshal. 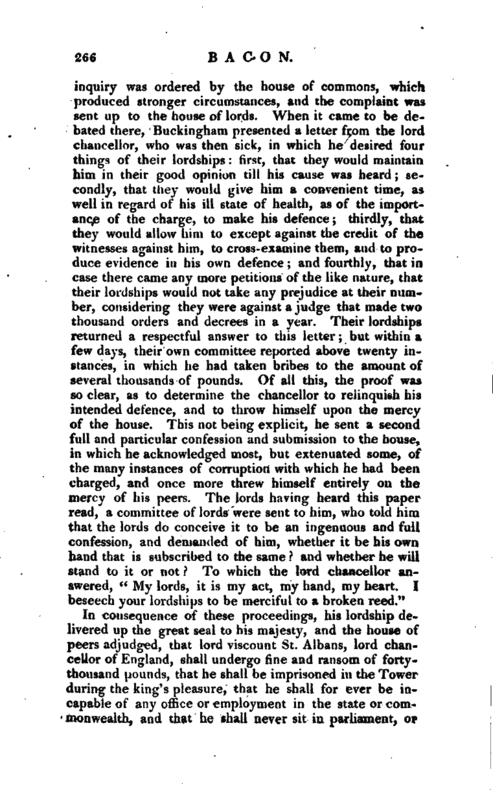 In this character he presided, though for a very short time, in the court newly erected, under the title of the Palace-court for the verge of the king’s house, in which station he has left us a very learned and methodical charge to the jury there upon a | commission of oyer and terminer, printed in his works. 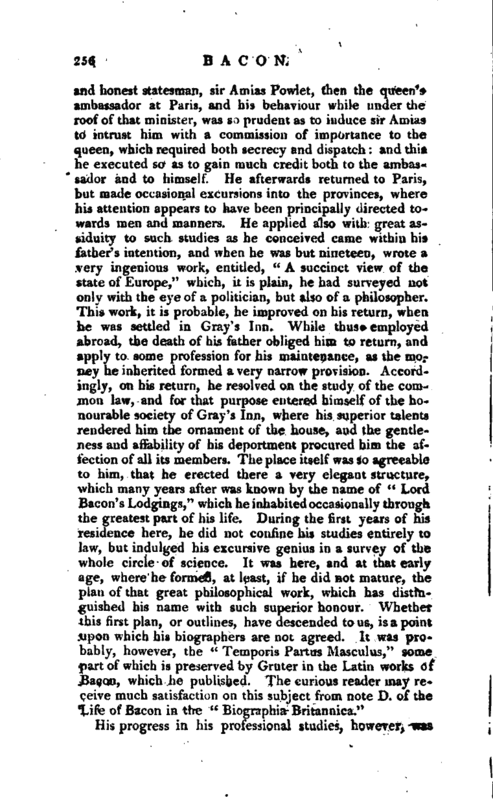 If his biographers may be credited, he enjoyed at this time an income of nearly five thousand pounds a-year, arising partly from his personal estates, and partly from his official emoluments; and although he was liberal and even profuse in his mode of living, yet as his public stations required no great display of magnificence, his circumstances must have been such as to remove him from the ambition of availing himself of the many opportunities of aggrandizement which his favour with the king afforded. It was not till 1613, that he succeeded to the office of attorneygeneral, of which he had had a promise, when sir Henry Hobart was made chief justice of the common-pleas. In this office he was, contrary to the usual practice, and in consideration of his eminent services, allowed to take his seat in the house of commons. He appears indeed to have received favours of distinction on all occasions, that were before unknown. Even in the court of star-chamber, when a solemn decree was made against duelling, his speech, which gave occasion to the decree, was, contrary to custom, printed with it. 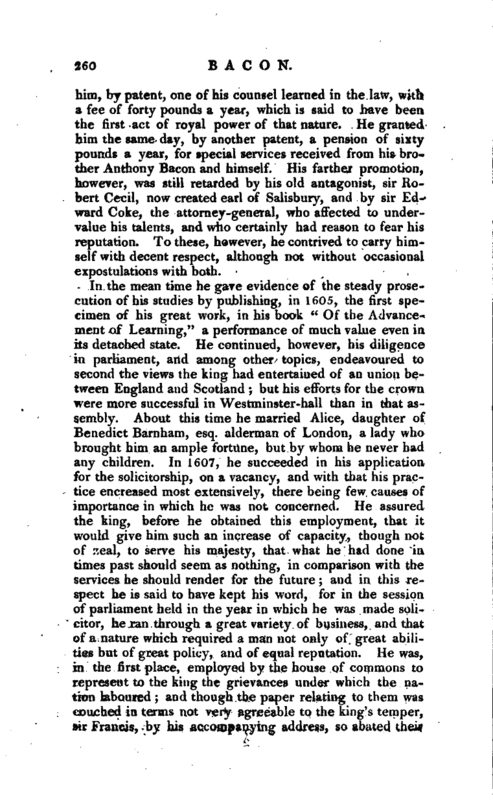 Such, indeed, was the weight of his character, that he stood in no need of support from the king’s ministers the earl of Salisbury was now dead, and it does not appear that he had any dependance on the earl of Somerset, the reigning favourite, but kept at a distance from him when he was in his highest power. 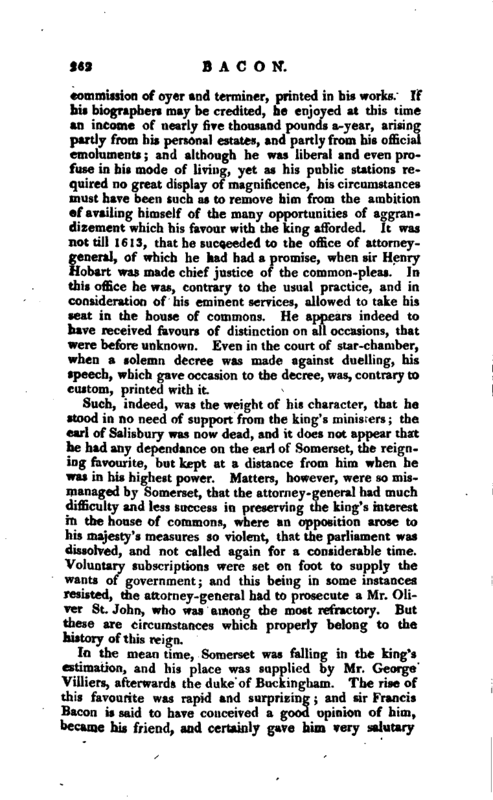 Matters, however, were so mismanaged by Somerset, that the attorney-general had much difficulty and less success in preserving the king’s interest in the house of commons, where an opposition arose to his majesty’s measures so violent, that the parliament was dissolved, and not called again for a considerable time. Voluntary subscriptions were set on foot to supply the wants of government; and this being in some instances; resisted, the attorney-general had to prosecute a Mr. Oliver St. John, who was among the most refractory. But these are circumstances which properly belong to the history of this reign. In the mean time, Somerset was falling in the king’s estimation, and his place was supplied by Mr. George Villiers, afterwards the duke of Buckingham. The rise of this favourite was rapid and surprizing and sir Francis Bacon is said to have conceived a good opinion of him, became his friend, and certainly gave him very salutary | advice. His promotion was followed % by the trial of the earl and countess of Somerset, for being accessary to the murder of sir Thomas Overbury. 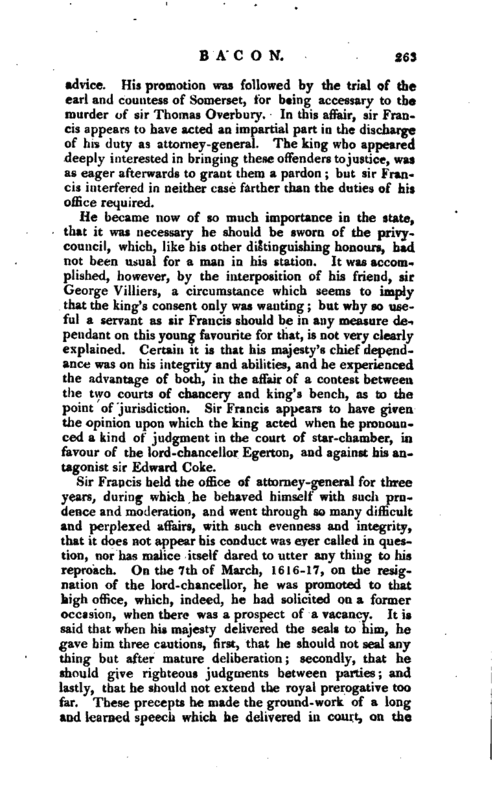 In this affair, sir Francis appears to have acted an impartial part in the discharge of his duty as attorney-general. The king who appeared deeply interested in bringing these offenders to justice, was as eager afterwards to grant them a pardon but sir Francis interfered in neither case farther than the duties of his office required. He became now of so much importance in the state, that it was necessary he should be sworn of the privycouncil, which, like his other distinguishing honours, had not been usual for a man in his station. It was accomplished, however, by the interposition of his friend, sir George Villiers, a circumstance which seems to imply that the king’s consent only was wanting but why so useful a servant as sir Francis should be in any measure dependant on this young favourite for that, is not very clearly explained. Certain it is that his majesty’s chief dependance was on his integrity and abilities, and he experienced the advantage of both, in the affair of a contest between the two courts of chancery and king’s bench, as to the point of jurisdiction. Sir Francis appears to have given the opinion upon which the king acted when he pronounced a kind of judgment in the court of star-chamber, in favour of the lord-chancellor Egerton, and against his antagonist sir Edward Coke. Sir Francis held the office of attorney-general for three years, during which he behaved himself with such prudence and moderation, and went through so many difficult and perplexed affairs, with such evenness and integrity, that it does not appear his conduct was ever called in question, nor has malice itself dared to utter any thing to his reproach. On the 7th of March, 1616-17, on the resignation of the lord-chancellor, he was promoted to that high office, which, indeed, he had solicited on a former occasion, when there was a prospect of a vacancy. It is said that when his majesty delivered the seals to him, he gave him three cautions, first, that he should not seal any thing but after mature deliberation secondly, that he should give righteous judgments between parties and lastly, that he should not extend the royal prerogative too far. These precepts he made the ground- work of a long and learned speech which he delivered in court, on the | 7th of May following, the day on which he took possession of his high office. He now hegan to experience the truth of the observation that the highest seats are the most exposed for within a little time after the king’s setting out for Scotland, which took place a few days after his appointment to the seals, the Spanish match was, by direction of his majesty, brought upon the carpet, and cost sir Francis very great trouble. 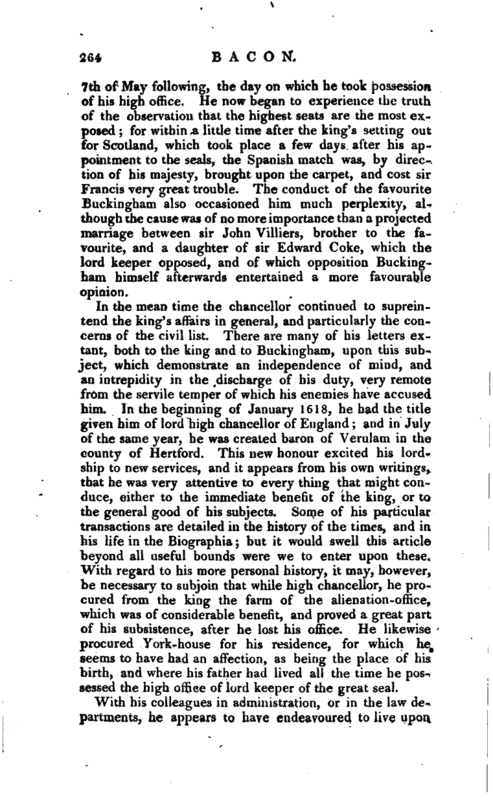 The conduct of the favourite Buckingham also occasioned him much perplexity, although the cause was of no more importance than a projected marriage between sir John Villiers, brother to the favourite, and a daughter of sir Edward Coke, which the lord keeper opposed, and of which opposition Buckingham himself afterwards entertained a more favourable opinion. In the mean time the chancellor continued to supreintend the king’s affairs in general, and particularly the concerns of the civil list. There are many of his letters extant, both to the king and to Buckingham, upon this subject, which demonstrate an independence of mind, and an intrepidity in the discharge of his duty, very remote from the servile temper of which his enemies have accused him. In the beginning of January 1618, he had the title given him of lord high chancellor of England and in July of the same year, he was created baron of Verulam in the county of Hertford. This new honour excited his lordship to new services, and it appears from his own writings, that he was very attentive to every thing that might conduce, either to the immediate benefit of the king, or to the general good of his subjects. Some of his particulartransactions are detailed in the history of the times, and in his life in the Biographia but it would swell this article beyond all useful bounds were we to enter upon these. With regard to his more personal history, it may, however, be necessary to subjoin that while high chancellor, he procured from the king the farm of the alienation-office, which was of considerable benefit, and proved a great part of his subsistence, after he lost his office. He likewise procured York-house for his residence, for which he seems to have had an affection, as being the place of his birth, and where his father had lived all the time he possessed the high office of lord keeper of the great seal. With his colleagues in administration, or in the law departments, he appears to have endeavoured to live upon | good terms. Buckingham he contrived to keep in apparent humour, although he frequently refused to put the seal to what he thought improper grants and he even agreed better with sir Edward Coke than was expected, always representing that judge to the king in the most favourable light. About this time, however, an attempt was made to the prejudice of the chancellor, which might have given him some warning of his fall. One Wrenbam, against whom he had made a decree, surmising he had wrong done him, the general case with clients who lose their cause, presented a libellous petition to the king against him, the suggestions of which were thoroughly examined, and it clearly appeared that the chancellor had acted as became him, and that he had in truth been very much injured by this Wrenham the suggestions, however, appear to have produced those effects on some minds which afterwards were displayed more conspicuously. In the midst of these important occupations, he was so far from neglecting his philosophical studies, that in the month of October 1620, he sent to the king his great work, the “Novum Organum,” the design of which was, to execute the second part of the “Instauration,” by advancing a more perfect method of using the rational faculty than men were before acquainted with, in order to raise and improve the understanding, as far as its present imperfect state admits, and enable it to conquer and interpret the difficulties and obscurities of nature. This work his majesty received as graciously as he/could wish, and wrote him a letter upon it, which certainly does honour to both their memories. He received also the compliments of many learned men on the same subject, and had every reason to be satisfied with the general reception of a work, which cost him so much time and pains. Such is said to have been his anxiety for its perfection, that he revised and altered twelve copies before he brought it to the state in which it was published. In consequence of these proceedings, his lordship delivered up the great seal to his majesty, and the house of peers adjudged, that lord viscdunt St. Albans, lord chancellor of England, shall undergo fine and ransom of fortythousand pounds, that he shall be imprisoned in the Tower during the king’s pleasure, that he shall for ever be incapable of any office or employment in the state or commonwealth, and that he shall never sit in parliament, or | come within the verge of the court. 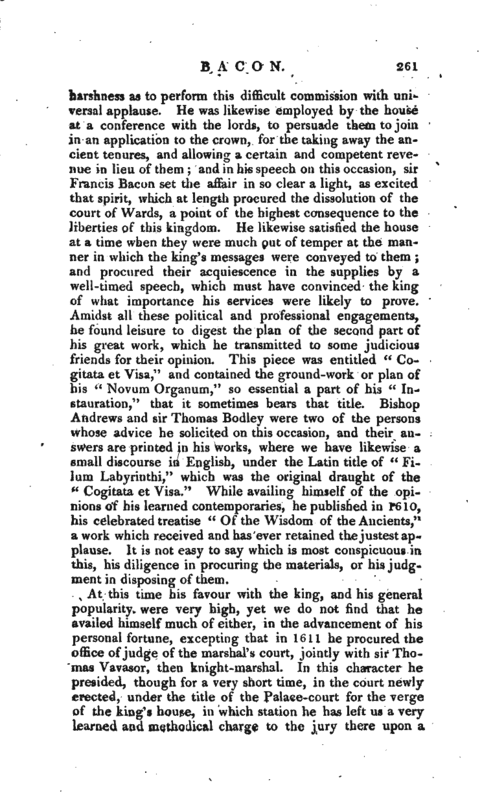 After a short confinement in the Tower, however, he was discharged, and in some measure regained his favour with the king, who, on the prorogation of parliament, was pleased to consult him, as to the proper methods of reforming the courts of justice, and taking away other grievances which that parliament had inquired into and his lordship accordingly drew up a memorial, which is extant in his works. Other marks of favour and indulgence were shewn him, which, amidst the anguish of a blasted character, so far appeased his troubled mind, that he resumed his studies with his accustomed vigour. In the spring of the succeeding year, 1622, he published his history of, Henry VII. which has not added so much to his reputation as his other works. 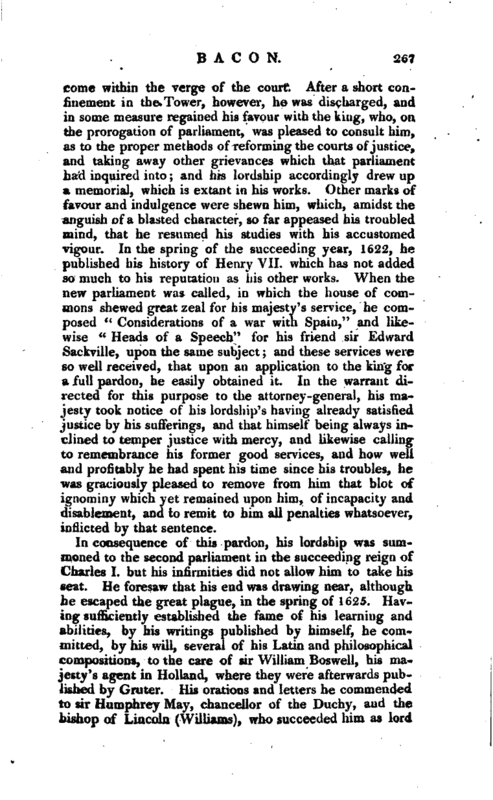 When the new parliament was called, in which the house of commons shewed great zeal for his majesty’s service, he composed “Considerations of a war with Spain,” and likewise “Heads of a Speech” for his friend sir Edward Sackville, upon the same subject and these services were so well received, that upon an application to the king for a full pardon, he easily obtained it. In the warrant directed for this purpose to the attorney-general, his majesty took notice of his lordship’s having already satisfied justice by his sufferings, and. that himself being always inclined to temper justice with mercy, and likewise calling to remembrance his former good services, and how well and profitably he had spent his time since his troubles, he was graciously pleased to remove from him that blot of ignominy which yet remained upon him, of incapacity and disablement, and to remit to him all penalties whatsoever, inflicted by that sentence. In consequence of this pardon, his lordship was summoned to the second parliament in the succeeding reign of Charles I. but his infirmities did not allow him to take his seat. He foresaw that his end was drawing near, although he escaped the great plague, in the spring of 1625. Having sufficiently established the fame of his learning and abilities, by his writings published by himself, he committed, by his will, several of his Latin and philosophical compositions, to the care of sir William Bos well, his majesty’s agent in Holland, where they were afterwards published by Gruter. His orations and letters he commended to sir Humphrey May, chancellor of the Duchy, and the bishop of Lincoln (Williams), who succeeded him as lord | keeper, and acknowledged the honour of that trust, which letters he enjoined to be preserved, but not to be divulged, as touching too much on persons and matters of state. By this judicious care of his, most of his papers were preserved, and the greatest part of them at different times have been printed and published. The severe winter which followed the infectious summer of 1625, brought him very low; but the spring reviving his spirits, he made a little excursion into the country, in order to try some experiments in natural philosophy; in which journey he was taken so ill, that he was obliged to stop at the earl of Arundel’s house at Highgate, about a week, and there he expired, April y, 1626, and was privately buried in the chapel of St. Michael’s church, within the precincts of Old Verulam where a monument was erected to his memory by sir Thomas Meautys, his faithful friend and indefatigable servant in all his troubles. The political character of lord Bacon is sufficiently determined by those events in his life, about which there can now be no dispute. However we may lament the fall of such a man, it appears too plain that it was owing entirely to his own misconduct, and neither to the intrigues of his enemies, or the temper of the times. He remains an awful example of the brightest character upon record, sullied by the vices of ambition and ostentation; for the latter betrayed him into expences which he was glad to defray without consideration of the means, nor is it much palliation of his great offence, that he was neither covetous nor avaricious. If, however, we contemplate his personal character and his mental powers, he must appear to be one of the greatest and wisest men that ever contributed to human knowledge. 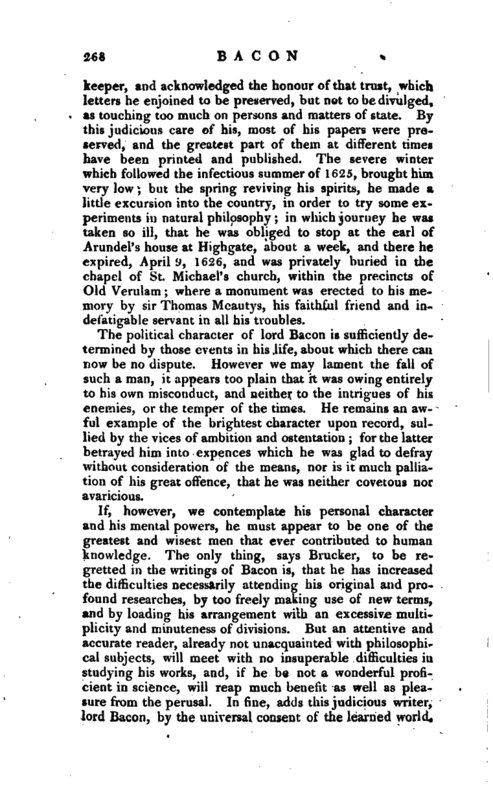 The only thing, says Brucker, to be regretted in the writings of Bacon is, that he has increased the difficulties necessarily attending his original and profound researches, by too freely making use of new terms, and by loading his arrangement with an excessive multiplicity and minuteness of divisions. 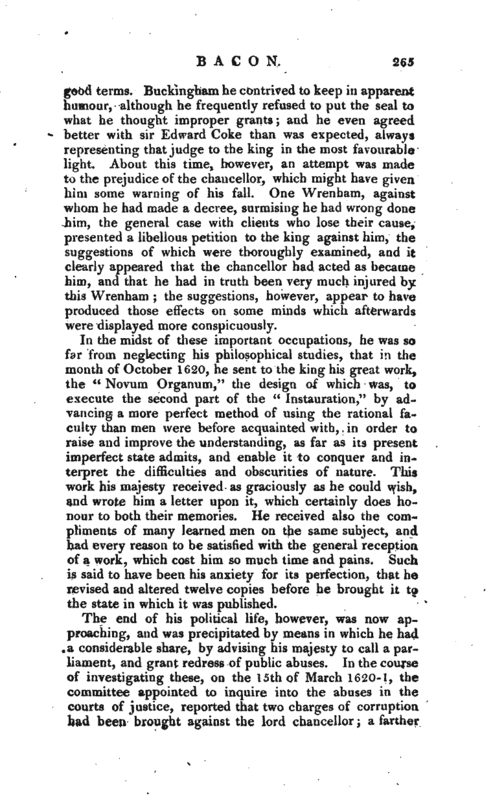 But an attentive and accurate reader, already not unacquainted with philosophical subjects, will meet with no insuperable difficulties in studying his works, and, if he be not a wonderful proficient in science, will reap much benefit as well as pleasure from the perusal. 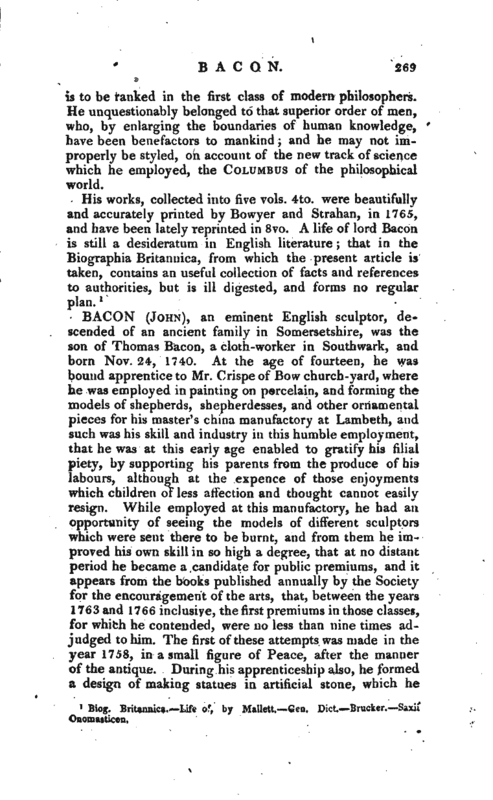 In fine, adds this judicious writer, lord Bacon, by the universal consent of the learned world, | is to be ranked in the first class of modern philosophers. He unquestionably belonged to that superior order of men, who, by enlarging the boundaries of human knowledge, have been benefactors to mankind and he may not improperly be styled, on account of the new track of science which he employed, the Columbus of the philosophical world. 1 Biog. Britannica, Life o r by Mallett. Gen. Dict. Brucker. —Saxii Onomasticon.